With the high quality Aluca shelving system the service truck is looking better than many a person’s kitchen. Rotator, the Hitachire presentative in Finland, purchased an Iveco Daily based Worxpace PRO service truck from VPE in the summer. Their mechanic Mikko Raitinen is putting the finishing touches on the machine. The latest addition were the Aluca shelves and at the moment the interior of the truck looks much better than many a person’s kitchen! 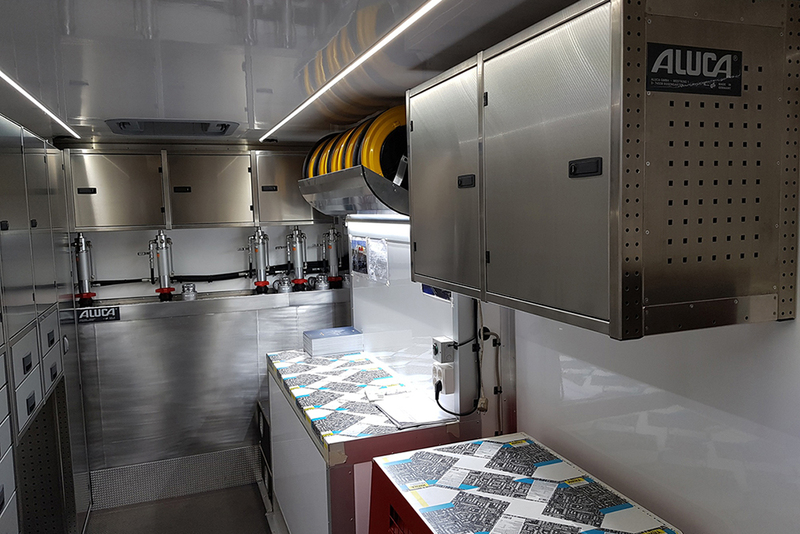 Thicker insulation layer and an extra heater unit makes it possible to use this service truck in the extreme weather of Northern Finland. The subframe is glued to the floor panel which makes the truck floor about 10 cm lower and easier for the mechanics to step to and from the vehicle. The remotely controlled Zepro tail-lift in the back has a lifting capacity on 1 t. The truck is equipped with an Oil-Bar on the right side of the vehicle with a hatch opening upwards which has four different tankers. The used oil compartment inside the frame of the vehicle takes up to 470 l fluid. There are 2 roof windows for extra light and ventilation in the back. Top quality LED working lights on the rear and sides of the vehicle enable the mechanics to work outside in the darkness and stroboscope LED flash-lights make the vehicle identifiable. The reverse camera in the back makes manoeuvring a breeze.